Peer specialists are trained professionals in the behavioral health field who have personal experience with substance use disorder. The Substance Abuse and Mental Health Services Administration (SAMHSA) states that a peer specialist (also known as a certified peer specialist, peer support specialist, recovery coach) is a person who uses his or her lived experience of recovery from mental illness and/or addiction, plus skills learned in formal training, to deliver services in behavioral health settings to promote mind-body recovery and resiliency. Since 2000, over 15,000 peer specialists have been trained in the United States. With the number of peer specialists continuing to grow, we wanted to hear how specialists are impacting those working in the recovery field. We spoke with Ivy, the Director of Program Housing for Perspectives, and asked her how working with peer specialists has impacted her team. 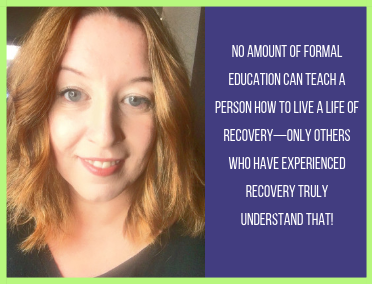 At Recovree, we see the immense value in peer support specialists and the impact they are making on the recovery community. Our products support specialists so they can improve efficiencies, manage time, have a deeper understanding of their clients' needs and utilize best practices. We want peer specialists to spend less time on administrative tasks and more quality time with their patients.